Today’s recipe was sent to me by Sue, who found it on some junk mail. It was originally called “Sugarless Oatmeal Cookies” but I find this misleading because bananas, milk and raisins all have natural sugars. Name issue aside, I was interested enough to make a quick batch this afternoon. To be safe, I used one banana and made 1/3 of the recipe below. I didn’t have any raisins so I used Craisins in part of the batter and chocolate chips in the other. These are pretty good. They’re not really like cookies so much as little piles of baked banana oatmeal with add-ins…which could be a good thing for breakfast or snacks. I’ll be interested in hearing what others think. You may want start with 1/3 of a batch just to be safe. Melt butter in a microwave-safe mixing bowl or in a large saucepan. Add all remaining ingredients, but watch the milk because you may not need all of it. Let stand for about 5 minutes, until oats are soft. Lightly grease a cookie sheet or line with nonstick foil or parchment paper. For each cookie, spoon out about 1 T. of dough and drop it onto the greased or lined cookie sheet. Bake the cookies for 15 to 20 minutes. Let cool on the cookie sheet for about 1 minute. Move the cookies to wire racks or a towel to cool. What if we used quinoa instead of the oats? Think this will work? I will try it this weekend and let you guys know. Thanks! I really don’t like rasins so i replaced them with pennut butter and made them for my dad, for father’s day. 🙂 Great recipe, thanks! Hi Stacy! It really depends on what you have. If you use super ripe and brown bananas, the cookies will be a little sweeter. Do you recommend regularly ripe bananas or over ripe like those you’d use for banana bread? Seems like a silly question since everyone has had success so far. I made these tonight, and replaced a half a cup of the oats with 1/4 cup flaxseed meal and 1/4 cup oat bran. I also added cinnamon, nutmeg and ground cloves, since it’s nearly Christmas and those spices seem appropriate for this time of year. I softened the butter, but didn’t completely melt it, and added craisins but no chocolate chips. My cookies came out more cake-looking than those pictured above, and less bumpy. They’re really good, and I like the added nutrition of the flaxseed meal and oat bran. They’re great! My son suggested we add a little dark brown sugar next time, to add to that warm, middle-of-winter taste. I thought they were great the way we made them, and he didn’t seem to have any problem eating them, either! Great recipe my family loves them. They are great frozen as well especially on a hot summer day. I’ll bet they were great with the Greek yogurt. I just discovered Greek yogurt not too long ago and love it because it has extra protein. I just popped these cookies in the oven, and I just wanted to post a little tweak I made. I used 0% greek yogurt in place of the milk, added a just a handful of chopped pecans, the cinnamon, and a tablespoon of agave nectar, just to bump the sweet up a tiny notch for my hubby. For the raisin or craisin, I used a dried berry pomegranate mixture that is sold at Trader Joe’s. They looked great going in the oven, and as I am writing this, they smell great all over my apartment. 🙂 And YAY it’s a snow day today! I just made these cookies today. My 8 yr old and 15 mos love them, and they are healthy for them. I have diabetes when Im pregnant which I am pregnant now, so I have to watch my sugar in take. These are great for me as well. I didnt add choc chips in them and added a teaspoon of cinnamon. They came out so good, going to keep the recipe to use again! Hey, I love the yogurt idea! I’ll bet it adds a little flavor and gives them an even better texture. Thanks for the tip. I just made these and they are really good!! I love them. I was googling banana oatmeal cookies for something good to use my last two over-ripe bananas for, since the last recipe I tried was nasty and I had throw all the cookies out! I just wanted something healthy but somewhat sweet so I did these without chocolate chips and they turned out great! Thanks for posting it – they are just what I wanted! May I know what kind of banana you use to bake this lovely recipe? thanks. If you freeze your ripe bananas first then you won’t need to puree them. Just cut off the end of a thawed banana and squeeze it out. these are good! i put in one egg (because I just couldnt believe they’d stay together), and added just over 1/4 cup flour (because the egg made them too moist). and I tell, you, I was really impressed and found this to be really good. Meredith, I think I used about 1/4 cup chocolate chips. I wouldn’t sub peanut butter for butter here. Hillary, pumpkin *might* work. I’m not sure. I’ve been on a bit of a cooking-with-pumpkin kick since, well, Thanksgiving. I should probably move on flavor-wise, but since I haven’t…, do you think I could subsitute pumpkin puree for the bananas in this recipe? Lewis, the chunks pretty much make the cookie. Lisa, I’m surprised that anything with butter could be considered for a cleansing diet. I guess butter is, at least, a natural food. Oil would never work in these. Carla, I hardly ever do those question/answer things but just this once… ;). Sue, thanks again for sending it. You get better junk mail than I do. Cakespy, these are rustic. That’s for sure. Nicole, I found them sweet enough. However, I added chocolate chips! I don’t think I’d ever make them without chunks of something sweet like chocolate or raisins. Emiline, I think they’d work great for diabetics. Not that I’m an expert, but they do have oats and bananas, which I think are okay. I’d probably add some diabetic approved chocolate chips (Splenda sweetened) or something. These would be good for people on special diets. I never know what to bake for my grandma, since she’s a diabetic. do they taste sweet enough even though the recipe doesnt call for any sugar? I love really rustic-y, textured gobs of cookie like this. These look awesome! I’m glad you got a chance to try these. I still don’t have any bananas in the house so I can try them myself, but I’ll put them on the list to try. I’m always up for an experiment, so let me know if it works out. However, I must say that the banana was really good here. I’m not sure apple sauce would work as well. Also, the chocolate chips and craisins seemed key. So if you try it with nuts, use a bunch. I think the matrix of oats, butter and fruit is okay, but this dough really needs to wrap itself around something. 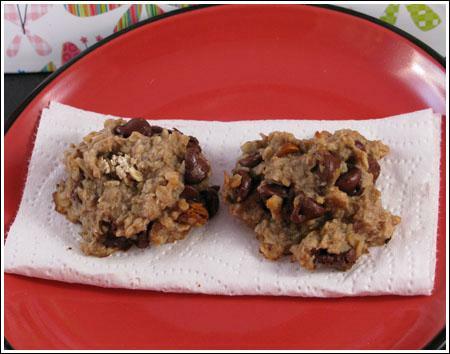 I wonder if you could make these with unsweetened applesauce and add nuts and a few spices instead of the raisins or chocolate chips… I may just try it! I made a version of this when I was once on a “cleansing diet,” trying to get the refined sugar out of my system. The only sweet thing allowed was this cookie sans raisins and chocolate chips. They were pretty good and helped me survive through the five or six weeks of the diet. I did decide, however, that going without dessert was just too much to bear and have made peace with my addiction.